Page by page, small groups of nocturnal Australian animals eat and play the night away. The story begins with a single, sleepy wombat waking up at dusk. Double-page spreads introduce various night-loving creatures in groups whose numbers grow from one to 10. The background of each scene is saturated in a monochromatic pastel, while the animals and their environment are rendered in black and gray, creating a nighttime feel as the full moon rises and falls across the illustrations. 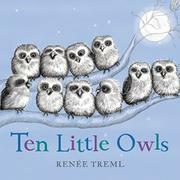 Deceptively simple, this board book offers many opportunities to explore counting, rhyming, and vocabulary. Though most of the animals—such as mice, bats, and owls—are familiar in North America, others—such as quolls, devils, and dingoes—may be less familiar to readers unacquainted with the fauna of Australia. The creatures enjoy the night in their own unique manners, presented in rhyming text that stretches across the pages and highlights the action verbs in colored and enlarged text: “5 little gliders / sip nectar from a tree. // 6 little fur seals / swim in the sea.” As dawn breaks, the solitary wombat that started the story returns to its dwelling to sleep.